Designed specifically to fit most rifles with or without threaded barrels. Can be used to HIDE some of the barrel or EXTEND the barrel length. See Tab Below "Adapters" to achive the exact look you want. We test all our Fake Silencers on .308 (NATO 7.62 X 51) caliber a bolt action sniper rifle (SAKO TRG 22) for accuracy / to see if there is any projectile impact deflection (less than 0.25" at 200 meters) and finally on M4 / M16 and or PKM machineguns (500+ sustained rounds) to test stability under extreme firing, vibration and heat (no problems). 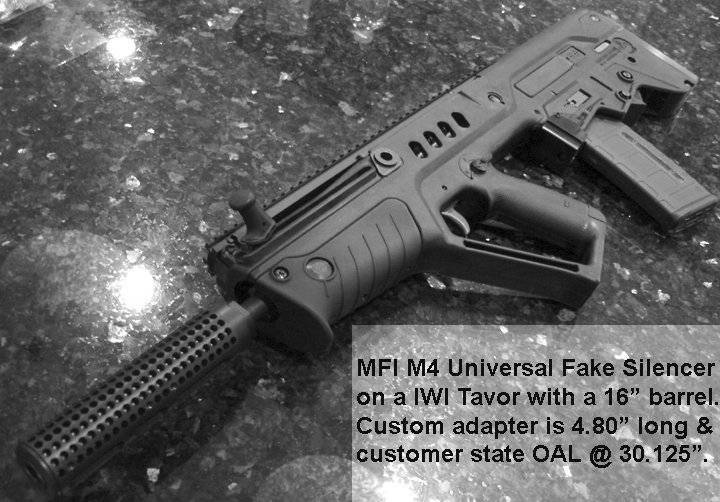 This Version of the MFI M4 Fake Silencer is BLANK / without any Marking or Laser Engraving. 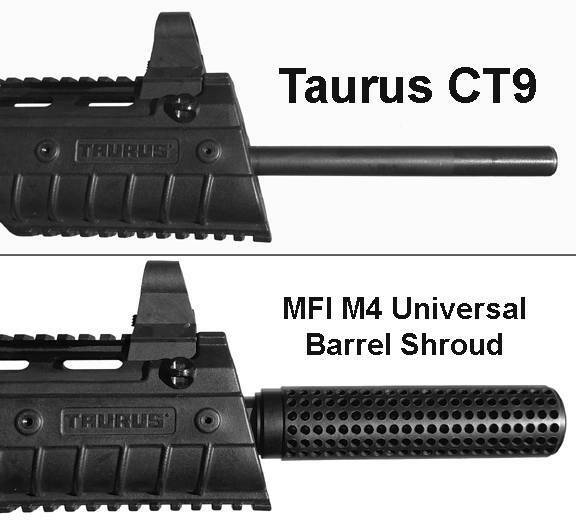 This product is "UNIVERSAL" meaning that it can be used on almost any weapon with a threaded barrel and even some weapons without threads (Requires at least 4.5" of exposed barrel with the barrel O.D. being less than 0.750"). HIDE YOUR BARREL: Hide / Cover some or all of the barrel. EXTEND YOUR BARREL: Extend Barrel Length to legal 16". The above photo shows an AR15 with a 10.5" barreled upper (not legal). Is the M4 Outer Body of the fake silencer which will slide over "B" the full length M4 (6.325")adapter. Is the M4 full length (6.325") adapter which will screw on to the AR-15 upper and be permanently attached to give you a 16" legal barrel length. The above photo shows a FN FS2000 with the M4 Barrel Shroud / Fake Silencer. Is a fade showing the M4 Outer Body slid over the existing barrel. You will see that without the adapter the fake silencer will NOT stay on. 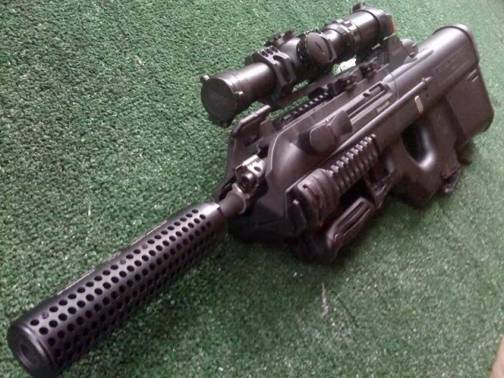 Is the Adapter for the FNH FS-2000. This adapter could be any length, but in this case it is just long enough to accommodate the M4 outer body. The adapter screws on to the existing barrel and the outer body slides over the adapter & the barrel and is held in place by set screws that make contact with the adapter and or the barrel. Is the end result... This same product and application can be used on AR15s, HK G3s, AK-47s, etc. One Adapter is included in the price of the Fake Silencer. This UNIVERSALITY is NOT Rocket Science. Everyone wants to make it more complex than it really is. The Outer Body is solid and has a hole (0.750" I.D.) that runs from end to end. This diameter is a little larger than what is found on most .223 / (5.56) or 9mm caliber AR 15 barrels, which are normally @ 0.725" O.D. We originally designed these specifically for the AR-15 platform. So the only LIMITING factor is Outer Diameter of your barrel. If your barrel's O.D is over 0.750" and you want to have the M4 Fake Silencer hide / slip over your barrel it can NOT be done. If you want to EXTEND your barrel length there is NO LIMITATION at all. What length of adapter you choose to use or whether you use an adapter at all depends on the final look that you want to achieve. How this works is that no matter what your application is; you will receive the same outer body as you see in the above photos. All outer bodies have a 0.750" inch hole bored out from front to back. In this hole slides your barrel and or the adapter which has a slightly less than 0.750" inch outer diameter. The inner diameter at the end nearest the front site will have a thread in it to accommodate your specific weapon (if you have a threaded barrel). The inner diameter of the EXIT end for all adapters is 1/2 inch. So this 1/2" exit hole basically necks down the larger 3/4 inch diameter of the OUTER BODY down to a more believable exit hole for a silencer. The 0.50" hole also accommodates any caliber up to .45 ACP for safe and effective firing. Both the outer body and adapter are finished in the same way to match 100% which give you a very clean finished look. A 5/64 allen key is required for installation. Set screw locations are indicated by "White Dots" and or "Black Arrows" in the photo above. 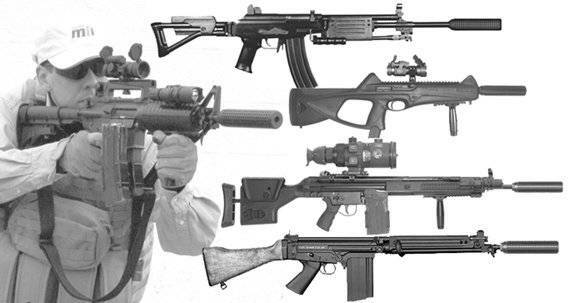 Fits most weapons known to man (see list below). Maximum Inner Diameter: = 19.0mm or 0.751 inches. Maximum Length: = 162.2mm or 6.390 inches. UNMARKED so that you can have your engraver mark it any way you like. Also Available with Professionally Laser Engraved. Please note that this item is NOT endorsed in anyway by the U.S. Navy Seals nor was it ever actual property of the U.S. Government. 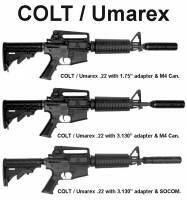 The UNIVERSAL M4 Fake Silencer / Barrel Shroud fits the following weapons WITHOUT ANY MODIFICATION. Note: Due to the weight of the M4 we do not recommend these for hand guns. Adding more than 7 ounces of weight to most hand gun barrels may not allow the gun to cycle completely. 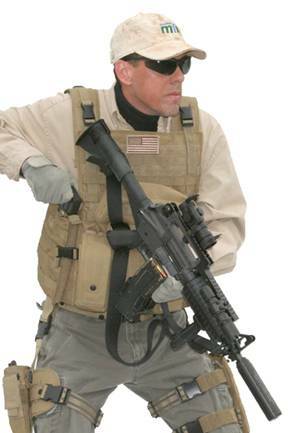 You should instead use the SOCOM MK23 style as these are 1/3 the weight of the M4 or SOCOM Universal. 1 - (One) FREE Adapter is included with this product. Additional adapters can be purchased separately. If you do NOT need an adapter you get a discount (Click on the "Adapters" option above) the discount is at the top of the list. Very few weapons will work without an adapter. The only example I can think of is a Post-Ban (1994 to 2004) AR-15 with a Bull Barrel (0.725" O.D.) that sticks out past the gas block at least 4.50" and does NOT have a threaded barrel. 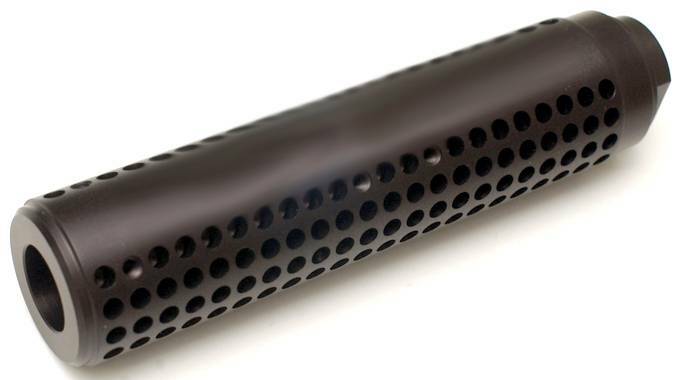 The M4 & SOCOM Universal Fake Silencers both have a 0.750" hole that runs from end to end. They both use the same adapters. These adapters have an outer diameter of 0.745" and fit inside the outer bodies of the M4 & SOCOM Fake Silencers. 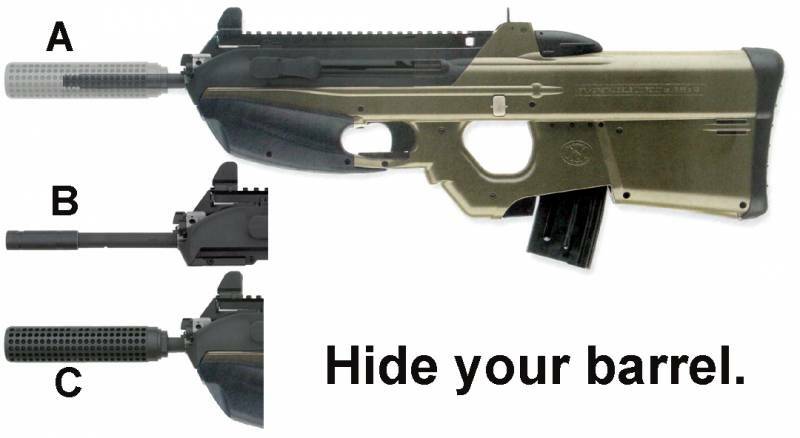 It is the adapter that makes the jump between the outer body of the Fake Silencer and the barrel of the weapon. Adapters allow the correct spacing & thread to attach the Fake Silencer to your weapon. The M4 Fake Silencer Outer Bodies have 12 holes for set screws (3 sets of 4 screws in a cross pattern) that will make contact with either the adapter and or the barrel of your weapon. The Adapters have grooves cut around them where the set screws will make contact. The grooves in the adapter correspond with the placement of the set screws in the outer body. The grooves supply a channel that the set screws sit in for greater stability / less possible chance for slippage. Because the Outer Body of the Fake Silencer is held in place on the adapter by set screws, you can therefore adjust / index the laser engraving on the outer body 360 degrees for perfect alignment. You will want to confirm the thread pattern on your weapon before ordering. WHAT LENGTH ADAPTER DO YOU NEED? If you are NOT hiding any of the barrel and are just extending your existing barrel length you will want to a FULL LENGTH Adapter. 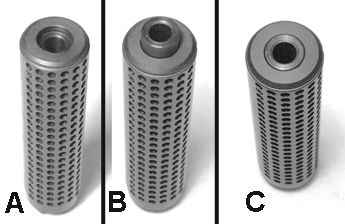 Full Length Adapters are adapters that are the same length of the corresponding outer bodies of the fake silencers. 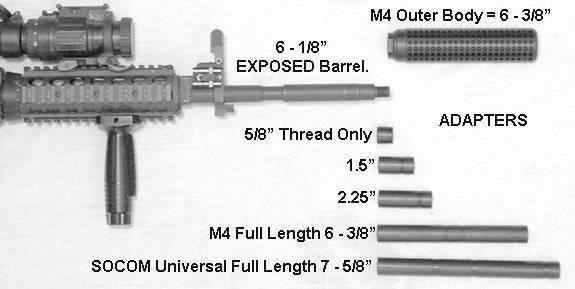 M4 Universal Fake Silencer has an OAL of 6.330", so a FULL LENGTH adapter for the M4 would be 6.330" long. 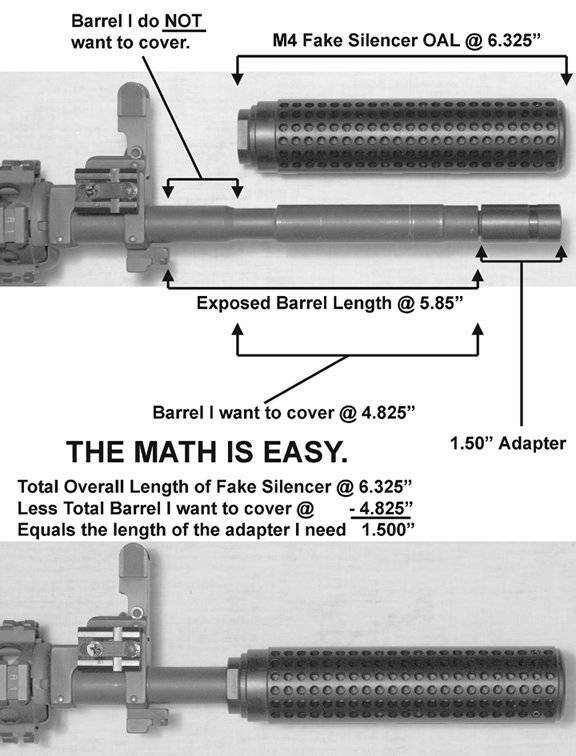 SOCOM Universal Fake Silencer has an OAL of 7.650" , so a FULL LENGTH adapter for the SOCOM would be 6.330" long. Full length adapters are most commonly used on AR-15 Uppers that have 10.5" or 11" barrels; to make a legal 16" over all barrel length. Our adapters are made of weapons grade steel so they are easy to permanently attach via welding. If you are hiding some of your barrel you will need to measure your EXPOSED Barrel Length (do NOT include any threads or flash suppressor length in the measurement). Exposed barrel is the area available to be hidden by sliding something over it in this case the outer body of the fake silencer. On weapons like AR15s & SIG 556s the gas blocks will mark the point where to begin measuring from. Your end point is where you normally would find a Peel or Crush Washer, again do NOT include any washer, thread or flash suppressor area in the EXPOSED area measurement. Flash Suppressors & Muzzle Brakes MUST always be removed no matter what. Front sights on bolt action rifles or on semi-autos like M1 carbine or the M1A / M14 need to be removed in order have any exposed barrel. First of all determine how much of the barrel that you want to hide and how much barrel you have available to hide. If you have 7.75" of exposed barrel & you want to hide 4.825" of your barrel then you will need a 1.5" long adapter. The math is simple… The total length of the M4 Universal Fake Silencer is 6.330" long. 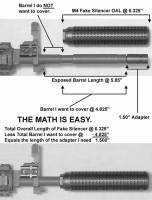 So the combined length of the area of the Exposed Barrel that you want to hide & the Adapter must equal 6.330". The reverse is also true… If you have only 4" of exposed barrel you can NOT use a 0.70", 1.5" or 2.25" long adapters as they will be too short. The end of the adapter MUST always be flush with the end of the exit hole of the Fake Silencer's Outer Body. 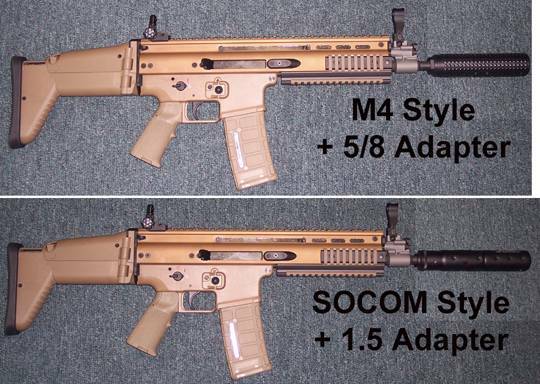 Conversely if you use a SOCOM Full Length adapter (which is 7.650" long") in conjunction with the M4 outer body you will have 1.32" of the SOCOM's adapter sticking out the back end of the M4's can. So get your weapon and a ruler out BEFORE you place your order. The above photo illustrates the simple math you need to use to get the exact look that you want. In the case of the above... If you wanted to hide more of the barrel you could do that by going with a SHORTER adapter. If you want to hide LESS of the barrel you would go with a LONGER adapter. The adapters MUST be FLUSH with the Front End of the Fake Silencer's Outer Body. Adapter or Barrel too short. WRONG! / INCORRECT FIT! Adapter or Barrel too long. WRONG! / INCORRECT FIT! Adapter or Barrel Flush / Even. CORRECT FIT! Custom Adapters are available at an additional cost (Click on the "Adapters" option above) Custom Adapters are 2nd on the list. A Custom Adapter is any adapter that does NOT appear in the adapter options list. You must specify the exact total length and thread pattern (including pitch / tpi) when ordering. You will write this information in the "Order Section" of the shopping cart, just below the "Payment Information" where it says "Special Request / Custom Orders". All adapters will have an outer diameter of 0.745" and the Maximum length of an adapter is 7.650" long. Here is a list of the available threads that we have taps for. 1/2 X 36 Right Hand (9mm - AR15 / M16). 9/16 X 24 Right Hand (FN FAL Inch Pattern / MP5 / M1 Carbine / ). 9/16 X 24 Left Hand (FN FAL Metric Pattern / FN F2000 / FN M240 / FN M249 / MAG 58 ). 5/8 X 24 Right Hand (AR10). 0.575 X 40 TPI Right Hand (Glock 40 & 45 Cal. Barrels from FAC / Guns & Stuff). 0.578 X 24 TPI Right Hand. 0.578 X 28 TPI Right Hand (Glock 21 & 30 Lone Wolf Barrel 45 ACP, SIG P220 Combat Tactical 40 & 45 Cal.). 0.595 X 32 TPI Right Hand (Springfield M1A, M-14, Fulton Armory M14). 13mm X 1.0 Pitch Right Hand. 13mm X 1.0 Pitch Left Hand (Steyr AUG & Microtech MSAR STG556). 13.5mm X 1.0 Pitch Left Hand (HK USP 9mm SD / Tactical & SIG Sauer P226-R / Tactical). 14mm X 1.0 Pitch Right Hand. 14mm X 1.0 Pitch Left Hand (AK47 / AK-47). 14.5mm X 1.0 Pitch Left Hand (HK USP Tactical .40 Cal.). 15mm X 1.0 Pitch Right Hand (G3 / HK 91 / G33-55 / HK-93). 16mm X 1.0 Pitch Right Hand (HK SOCOM Mk. 23). 16mm X 1.0 Pitch Left Hand (HK USP Tactical .45 ACP). If you do not see the thread you need on the list above just contact us for a quote for a Special Thread. We may already have it, but forgot to list it here. Completely changed the way my rifle looks!Really adds a "special ops" look to it. The quality is also top notch. Installs and removes effortlessly. I needed a custom adapter made to achieve the look I wanted but all I did was take the appropriate measurements and sent them with the order. What I got was an adapter with a perfect fit and perfect look! Great Price!Great Quality!Great Look! Would totally recommend! Two thumbs up,Thanks MFI! Top Notch Quality and So Cool on my AR! 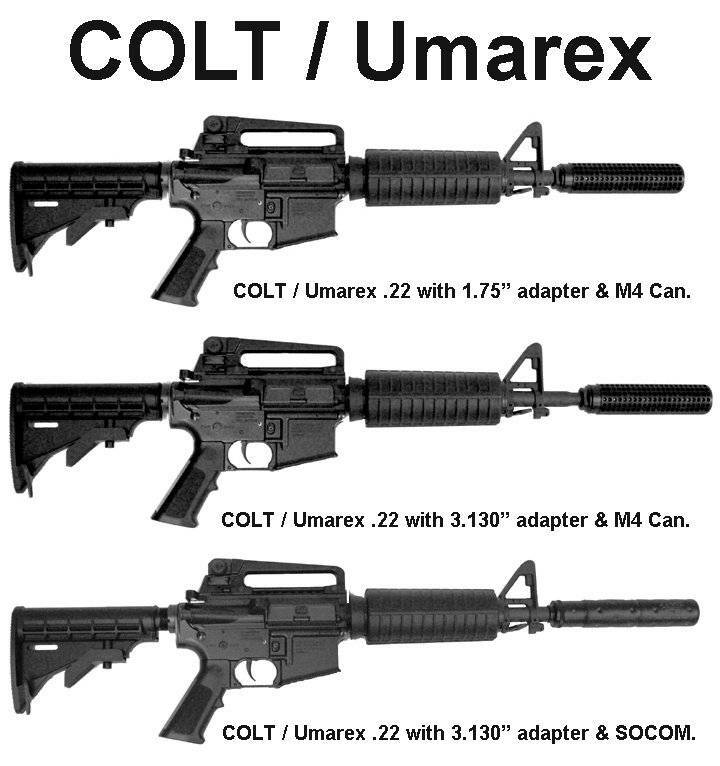 I have to admit that when I first read about these on AR15.com I was skeptical, but it made sense as I really wanted to hide that stupid long barrel on my Colt M4 carbine. So I ordered both the NAVY SEAL and the BLANK versions, figuring I would keep the one I liked the most and just return the other one. HOLY MOLLIE! Just out of the box these were cool... then on the weapon it simply transformed it to a whole new look! I have to say that the machining is top quality and this is by far the nicest & coolest accessory I have ever bought for my AR. Now I see how they can fit on any weapon. So I ended up keeping both and I just sent my adapter back to trade for one for my FNC... With quality like this it is no wonder why MFI has such good press on the forums. I would have paid a lot more for this item, so I also feel like I got a great deal too. FREE SHIPPING & super fast turnaround time... I placed the order on Tuesday night and it was in my hands on Thursday? I purchased this carbine less than a month ago and was looking for just the right fake silencer to finish off my barrel. I looked at other barrel attachments, but none looked as good as these. I contacted MFI by email reguarding some questions I had and was contacted back by Michael Frost CEO of MFI, talk about customer service. He told me they had not made a silencer for this carbine yet and he would work with me to make one. We talked by phone and email. I wanted the M4 "blank" style fake silencer, he took the 2.25 AK47 and bored out the threads to a depth of 1.75" this would let it slide over my barrel and leave me adjustment if I wanted to adjust the length about an inch. Yes I know this is more money than some but it is well worth it. Very nice fit and finish and Great customer service. Thanks Michael it was a real pleasure doing business with you, Larry R.
Export to Canada & Fits and Looks Great! Received the item yesterday. No problem, didn't even get dinged for sales tax. Just to let you know I mounted the M4 universal on a 9mm Just Right Carbine - Canadian version. (19" full round, no threads, .749" barrel). It fit perfect like it was machined exactly for that barrel. The long barrel looked really stupid before, but with the M4 on it the whole gun looks very high end. Can't thank you enough for all your help. My M4 just arrived today! WOW! What a transformation to my .45cal Hi-Point carbine! I love the 4595TS but it is certainly not the most handsome carbine on the market. I got my M4 in the mail today and in just 5 mins installed it and it completely changes the look of the gun! Such a "BEEFY" addition! I took it to the range today and got multiple comments! not on the carbine, but on the M4!!! It rocks!! Thanks Mr. Frost! Customer Service was absolutely amazing and shipping was lightning-fast! I will do business with you again!